It is now about a year since the naming ceremony and float out of Queen Elizabeth, and a great deal has happened in the development of the two aircraft carriers since then. Queen Elizabeth is now well into the commissioning and completions programmes, with around 550 of the 3000 compartments on board now having passed through Compartment Completion Inspection and been locked up ready for handover to the Ship’s company. The accepting authorities have been very pleased with the standards achieved at these inspections. The bridge area has been handed over to the Mission System team and the installation of the processor cards and other electronic equipment is nearing completion which will allow the Integrated Navigation and Bridge System to be commissioned. The Integrated system provides for a common look and feel across the systems in the bridge which will enable navigation of the ship with a leaner manning than would have been traditional. Installation of the High Frequency communications processors in the radio rooms has also commenced. All four of the ship’s main diesel generators have now been run, which is a significant milestone for the project. This now enables the power and propulsion team to progress through to commissioning the two gas turbines and moving on to commission the propulsion system. The ship is connected to a very large high voltage load bank ashore and the ship is currently fitted with brake propeller blades which absorb shaft torque without producing thrust. Through a combination of the load bank and the brake blades it will be possible to run the generation system up to its total 110 MW while the ship is afloat at the fitting out quay. Off the ship a successful series of trials have been carried out using the second ship’s propeller boss to remove the brake blades and fit the propeller blades by divers working underwater. This has proved the feasibility of the operation, mitigating a significant risk on the programme and validating the time allowed for within the programme. The Long Range Radar fitted atop the forward island has now started to be rotated and tracks recorded in the Operations Room. Attention will shortly be turned to the Artisan Medium Range Radar which will be fitted to the aft island. Factory Acceptance Testing is being carried out on the Isle of Wight in early August with the plan to install the radar and associated equipment onto the ship through September. The Queen Elizabeth team are all committed to completing the outfit and commissioning handing it over to the ship’s company and enabling first of class flying trials to be carried out in late 2018. Prince of Wales has also moved on a long way throughout the year, it is currently around 74% complete. The forward half of the ship, including the forward island is now structurally complete in the build dock. Indeed from the head of the dock it looks like a complete aircraft carrier which is quite remarkable considering that less than a year ago the dock was empty. A mass of scaffolding has been constructed around the forward end of the ship and work has commenced in blasting the topsides and applying the top coats of paint. At the BAE Systems shipyard at Govan on the Clyde, Lower Block 04 the final large block making up the after part of the HMS Prince of Wales hull has been completed and rolled out of the build hall ready for load out onto the semi-submersible barge and transportation to the build dock at Rosyth. 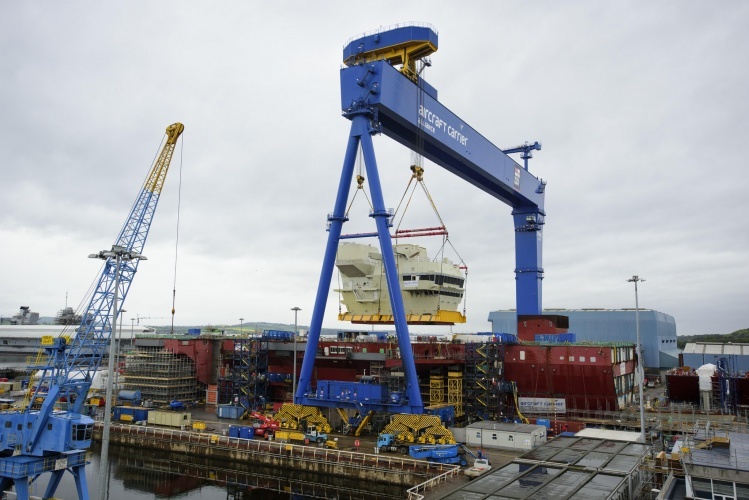 It is scheduled to arrive at Rosyth at the end of August, where it will be docked down and the whole of the front half of the ship hydraulically skidded back to meet it. The final upper blocks are nearly ready for shipping from Cammell Laird’s shipyard at Birkenhead while the aft island and the very aft end of the ship, Lower Block 05, are nearing completion at Govan. 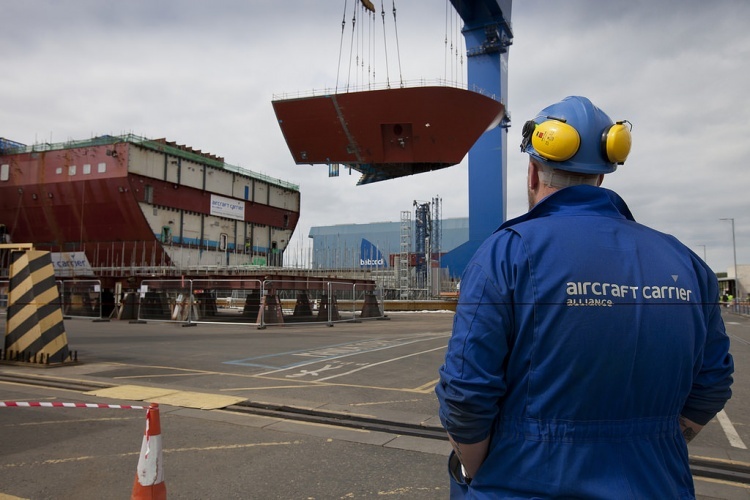 Remarkably the shipbuild work across the country will be complete by the end of the year with all the assembly and outfit activities taking place at Rosyth. 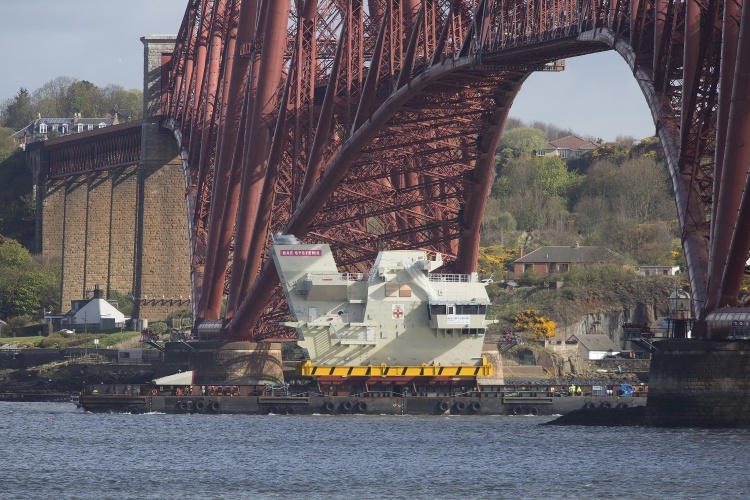 We now very clearly have two aircraft carriers at Rosyth. At Portsmouth around £100M of investment is being made on developing the infrastructure that will be required to make Portsmouth Naval Base the home port for the two carriers. This includes dredging of Portsmouth harbour, modifications to the jetties and mooring arrangements, installation of high voltage shore electrical supplies and the provision of office space for the people needed to support the ships as they enter service and work up to full capability. In addition work is going on between the Aircraft Carrier Alliance, the MoD and the Ship Support Alliance to ensure that the processes and procedures are in place that will enable the ships to seamlessly enter into service. 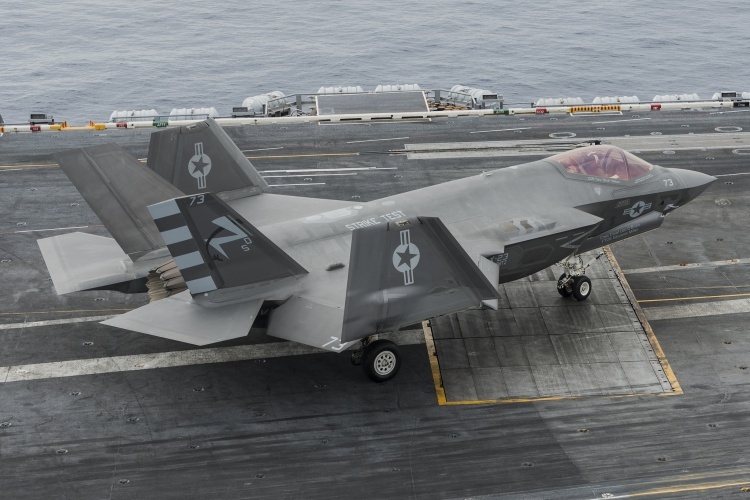 The US Marine Corps, following extensive flight trials with the STOVL F35B aircraft on USS Wasp, have declared Initial Operating Capability for their aircraft and the flight decks of the US ships are being recoated with heat resistant thermal metal spray to withstand the temperature of the F35 jet efflux. This is a great step forward for aircraft ship interface and has significant read across to mitigating the risks of operating these aircraft from Queen Elizabeth and Prince of Wales. A great deal has happened in the last year, and this time next year Queen Elizabeth’s ships company will be moving on-board in preparation for the start of sea trials. This is a great step forward for aircraft ship interface and has significant read across to mitigating the risks of operating these aircraft from Queen Elizabeth and Prince of Wales. couldn’t have put it better………. Again and again, I have the impression reading of these two White Wales? that it is the electronics, guidnce and communication(s) systems and their interaction which are and will be the mechanisms that really make them ‘tick’. [Actually that should probably be ‘hum’.] I could go along with the expenditure of money and assets (mental & physical) if I was assured that each lesson applied and learned during the manufacture of these monsterous items was assessed by a civilian-dominated group: tasked with ensuring that value for money and ‘spin-off’ for ‘ordinary’ use was constantly sought. Any chance? I sincerely hope that those responsible have been redoubling their efforts to ensure that the electronics are absolutely sacred, non-disturbable, and completely unchallenged: notwithstanding the effort that is being applied to the lego/meccano process of manufacture. One of my ‘student’ tasks in my Industrial System Design module was to set two groups of students to consider major public structures/spectacles: and how to both protect and distress such. The London Eye was a regular example. Causing it to self-destruct by over-riding the speed control/and or the sensors was one proposal: ie using the very mechanism to its own disadvantage. If I recall the two (or more) major incidents involving loss of missile-launching submarines probably had their roots in sensors and instruments not detecting (or having been deliberately sabotaged) the fact that the ‘outer-doors’ were still closed. As I understand it, the two other major nuclear disasters (Three Mile island and Chernobyl) had their roots in the simplests of errors, compounded by the belief that ‘the instruments must be correct! [unlike the Thetis disaster in 1939, where it was the fact that the outer-door was already open when the inner door of a torpedo tube was also opened! I have personal links to this: and my father (a civilian attached to the Navy was one of the ‘team’ tasked with establishing the cause and a correction for this. We now very clearly have two ships at Rosyth and no aircraft to fly from them. Oh dear, that old chestnut. We took delivery of the first F35B’s in 2010, and have been training and testing with them since then? 809 Naval Air Squadron was reformed a while back , a further 1 or 2 squadrons will probably stand up as both carriers come into active service. What do you think the govt should have done? Bought the full 138 planes planned, and put them in a warehouse until 2018 when the first carrier stands up? The introduction of the F35 is following exactly the same procedure any brand new jet would go through. This was very useful information for a engineering student. You told a very nice direction. Please keep posting. Now we have committed ourselves to the jump jet system, it’s infuriating to think we have to go cap in hand the U.S for the planes which will cost us billions when not to long ago we lead the world in vertical take off technology. This will be to our detriment in one way or another. We should be building these planes in Britain using shared technology, with the U.S. Not reliant upon when they see fit to supply us with planes (which are no priority to them).